John Goetz, “Aphrodite," 2003, encaustic/oil/acrylic on canvas, 72”x 60”. 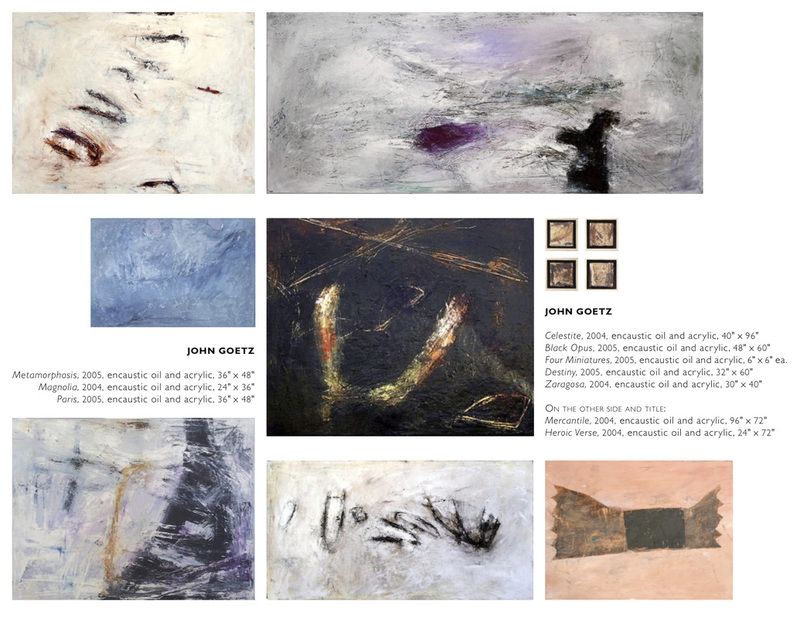 John Goetz’ images are full of movement--bending, walking, running, kicking, spinning, strutting, whirling, dancing. His figures are abstracted, composed of streaks of color and gestural lines. Two-by-two or by three they parade across the canvas. The mottled chromatic background is a rich blend of bold color, marks and scratches on a thick surface made up of oil, acrylic and encaustic. Occasionally, as in Europa, the figures are distinct enough to identify. Two females wearing bathing suits or leotards may be strolling along the beach or leaving a workout. When the figures are thus defined, we tend to focus on the who, what, where and why of the figure, rather than the emotive content of the forms. Goetz’ more successful images suggest, rather than portray the figure. In Red DeVille, three mostly-black forms stand out against a mostly-red background. A smear of color represents the torso. A few marks and scratches imply the movement of an arm or a leg. A pale yellow glow encircles each form, activating it, pumping it full of energy. These are highly-charged colors: the powerful black figure is blasting through the passionate red space. At this level, the image reflects human emotions in a raw, primal state. But there is softness here, too. The red leans toward the yellow side of the spectrum, with pale yellow showing through the mottled background. This adds a sense of quiet joy to the exuberance. Goetz seems to favor warm colors, but there are exceptions. He infuses the background in Iceland with a cool blue. The two figures, although they are given their share of red and black, are mostly white or pale pink. The question of whether the figures are advancing towards us or have their back to us is as unclear in the other paintings as it is in Iceland. Yet, because of the cool palette, it appears that the two figures here are becoming more distant from us and from each other as well. Despite the activity they pursue in tandem, despite their parallel motion, there is a powerful sense of isolation and of spacial mystery. Metropolitan, with its black background, is the darkest image. Again, the figures appear to be receding from us, moving into a background that is darker, denser, deeper, more unknown and frightening than the space in which they are now, with its blotches of gray. Perhaps that is why they hover together. While most of Goetz’ figures maintain a distance from each other, these three, in Metropolitan, overlap one another close enough to touch--as if each one instinctively grasps the primordial truth of strength in numbers, as if each one needs the reassurance of being with the others. Alone or together, stripped of all clothes and exterior accoutrements, Goetz’ dynamic figures evoke an emotional response. Whether the frenetic energy flows from them untethered, or whether Goetz blends together a range of emotions, the result is that in this group of images he portrays a complex picture of the human psyche. John Goetz,“Europa," 2002, encaustic/alkyd/oil on canvas, 72”x 60”. John Goetz, “Iceland," 2002, encaustic/oil/alkyd on canvas, 72”x 60”. John Goetz, "Metropolitan Nights," 2002, encaustic/oil/alkyd on canvas, 72 x 60"